All of the Break Blade movies have been incredible and enjoyable to watch! My average score for the movies were usually a 9, which is really awesome!! I absolutely loved them! So why on earth would I give this movie a 7? It's simple. Because I didn't love it nearly as much as the other 5 movies. After the first 5 movies, I expected this one to wrap up everything that was being built up. I wanted to see a final battle between the two nations or kingdoms, I wanted to see Zess fight against his former friends! There were so many things I wanted! And what did I get? You guessed it: none of those. About 90% of the movie was of a fight between Rygart and Borcuse. Who is Borcuse? Well...he's nobody really. He didn't have much of a build up in character other than being a jerk and killing many innocent people. Now, the fight between them was awesome! I loved watching it! But as a final battle? I was really expecting more of a plot twist of some sort. Not only was the majority of the movie just fighting, the ending was overall not very appealing. By that I mean, I was left with the feeling that another movie should be made. There were some questions left unanswered and some new plot development left hanging. If there were another movie following this one, I might give it a better score because then I would be awaiting more epic battles and answers to my questions! That's the reason why I think this deserves a 7. I have seen many 'Mech' animes, in other words, robots or large machines fighting each other. And several of them are incredible and nicely done! This one however tops most of those other mech animes, simply because of the art! The background art is to die for, the details put into it are spectacular and look very realistic! The same goes for the mechs that we watch fight each other. You can see every line and detail on the mechs and see the damage each one has taken, making things much more dramatic and intense. The people, although not as detailed as the backgrounds or the mechs, are nicely drawn and coloured nicely to blend with their surroundings, in other words, they don't have the usual anime style of bright purple or blue hair and bright white skin. They look like normal people, which matches perfectly with everything else in the movie. In most cases, there is music put into the scene just for background noise, and nobody really pays attention to it. With Break Blade, when the music comes on, you KNOW some awesome sh** is about to happen. The music is beautiful and intense. Whoever composed it needs to receive a medal or an award of some sort. I really felt the need to go get the album after watching this movie. If you watch this movie, definitely pay attention to the mind-blowing music! So, if the music was so amazing, why would I only give this an 8? Well, the voice acting wasn't the best. It wasn't bad, in fact it was good, but still not incredible. Hoshi Souichiro played the voice of Rygart, and although he is a good voice actor, he didn't seem to have the right amount of emotion and fierceness in his voice that I would have liked. Throughout this movie's battle between Rygart and Borcuse, there was a lot of yelling and shouting of all sorts, as you would expect in a battle, and something about Rygart seemed a little bit off. Maybe Souichiro just wasn't the right voice for Rygart, or maybe he needs some practice as a VA, either way, his performance wasn't the greatest. Nakai Kazuya did the voice of Borcuse in this movie. Nakai is a very talented VA in just about everything he does, and as many of you know, he is quite famous for several of his roles in other animes. The creators did a good job picking him to voice Borcuse, he had the right intensity and almost insanity that was needed to voice the bad-guy. As I said earlier, there were some things that bothered me about this movie, and character was part of it. Or rather, the lack of character development was the part that annoyed me. As a final episode (or movie) there should be an amazing or jaw-dropping plot twist that makes you go 'wow! that was amazing!'. But no, nothing was really changing about anybody. Rygart was the same was always, fighting and not really knowing why he was fighting, and question his own motives for joining the war. If it were me writing the story, I would have had Rygart finally make up his mind about everything and give a nice 'hero speech' of why he wants to win this war! As you can imagine, nothing of the sort happened. Borcuse was really the only other main focus of this movie, and he didn't do much to surprise me, just like Rygart. We really don't know much about this guy, other than the fact that he was leading the enemies in the war and he doesn't have any compassion for anything or anyone. If Zess and Hodr had received more screen time, I would probably review their characters as well. But Hodr and Zess both got a total of about 5 minutes in this movie. I had always thought of them as main characters in the beginning, but that really changed overtime and they just became part of the background. Even though I had many bad things to say about this movie, I couldn't bring myself to give it an extremely low score. I did enjoy the fighting and the intensity throughout the movie! But honestly, if there wasn't any fighting, I can guarantee I would have disliked this movie. The characters didn't have much to offer and the story was a bit less than incredible. With those two things being just average, than my enjoyment for it is also just average. If you have yet to watch the first five movies, I highly recommend you do so! They are amazingly done and exciting to watch! This movie, although not as great as the others, is still good and if you have watched the first five, then I obviously recommend that you watch the sixth one as well. But if you were expecting the same ending as I was, with a final conflict between Zess and his former friends, you are out of luck. I know that's what I wanted. But we can't always get what we want. Maybe in the future there will be a continuation of these six movies. But until then, I have to live with the fact that this movie is the finale, which is not what I would have expected or wanted. My review is based on all six episodes. But what I First gotta say is that they should have made it a bit more clear that they were moview and not just regular episodes. I thought the 50min episodes were so that the number of episodes were gonna be shorter and I only found out once I came to update my pro. Any way, I dislike mecha anime. Not any specific reasons but I loved this anime. The mechas drawn in this are not drawn looking all computerised, clean colour and out of place. This was a fast pace action anime. The plot basically is everyone has this special power which lets them move quartz (a mineral found in the earth). Sometimes a person 1 in a million is born without this power which is where Lygart and his brother comes in. Lygart is the main male role. He is called by his friend who is the king to help defend the kingdom which is being under attack. An ancient mecha is discovered and apperantly Lygart can only operate it. And so begins the war, through in moral dilemmas, friends as enemies, blood, greats actions scenes and you got yourself Broken Blade. It would have been a 9 but it felt a bit fast paced which I know is because they were movies but a little more build up would have made a great difference. As of late, there seems to be a severe drought of mecha anime. Luckily, mecha fans have been able to enjoy several high budgeted shows in the past year. One of them is Break Blade or also known as Broken Blade. This 6 part movie series is an adaptation of a manga of the same name and animated by Production IG and Xebec which aired between 2010 and 2011. This review will encompass all 6 of the movies and the overall score of it along with my opinions on the series. First off, the story to Break Blade isn’t too foreign to any other mecha anime. Our champion falls into a mobile suit; he does some heroics with it, and then gets caught up in some sort of war. This setting has been redone countless times and while not being highly original it fits the overall plot very well. The background of the story is a simple case of other countries invading each other for resources. The resource in question is quartz which runs everything in this particular world and is magically moved by “sorcerers”. We have two nations, Krisna and Athens which are heading to war. If this was completely cookie cutter, the champion selected to save the nation would be an angsty teen who is handed the latest and greatest mobile suit. However, in the case of Break Blade our champion is 25 year old Rygart Arrow who happens to be some sort defective person who cannot use magic called an “un-sorcerer” which makes him nearly completely useless in this particular world. He is asked by the king of Krisna who he happened to go to college with and the queen who had some romantic tension with Rygart in the past. He fights another classmate who’s on the Athens side and the story revolves around the struggles of Krisna fighting off the advancing Athenian armies with mobile suits (golems as they’re called in this series). In particular, Rygart’s mobile suit is an ancient relic which only he can pilot due to his lack of magic power and of course it happens to be stronger than any of the modern day ones. Like I said before, the story itself is not particularly outstanding or different but it does feature adult characters and a very interesting world that runs on quartz. I would have to say, the most lacking part of this particular series is the story. It features a somewhat realistic approach to fighting in mobile suits due to the vulnerability of them and their labored movements, but on the other hand it is definitely cliché and rehashed from nearly every other mecha series out there. It’s certainly not groundbreaking by any means but it was pretty entertaining, I say the story part of this series a 7/10 due to the clichés and lack of plot depth that is presented. As for the art, it is absolutely stunning. Production IG and Xebec did a fantastic job on animating this series. There is a great amount of detail that is put into everything from the mobile suits to the backgrounds. What adds the icing to the cake is the minimal use of CGI in this series. The animation is fluid and there is a wide array of scenic background scenes which also look excellent. I would have to say, the art is definitely one of the strong parts of this series. It looks great by today’s standards and is definitely not cheaply done. I say that the art of this particular series is a 10/10 just because of the amount of detail that was put into it. It truly does look stunning, especially when watched in 1080p. Another strong point of this series is the sound. We have a stunning opening done by KOKIA and the music is composed by Hirano Yoshihisa who also worked on Death Note and Ouran is well done and fits the overall mood of the series. As for voice acting, we have an all star cast. It features Hoshi Souichirou (Kira Yamato and Sanada Yukimura) as Rygart, Saito Chiwa (Senjougahara Hitagi and Akemi Homura) as Queen Sigyn, Nakamura Yuuichi (Okazaki Tomoya and Graham Aker) as King Hodr, Kamya Hiroshi (Araragi Koyomi and Matou Shinji) as Zess voicing the main cast of the series. The wide array of other characters are filled out with “the voice of 2011” Hanazawa Kana, Inoue Marina, Shiraishi Minoru, and many more. The veteran cast of voice actors only adds to the appeal and makes the overall setting much better. The sound of this series is definitely another one of its strong points. I say that the sound gets a 10/10 as well just because of the stunning voice acting cast that this series features. The great music added on top of it is just a very welcome bonus. The characters for this are pretty decent albeit somewhat cliché. There are many different characters of this series and they seem to fall into an expected manner. We have Rygart, who despite his more mature age is a stereotypical mecha anime protagonist. He is angsty, he loves to go off on his own, and of course pilots an overpowered mobile suit. He fits right into the groove of most other mecha protagonists and while this isn’t particularly a bad thing, his actions can be easily read by an experienced viewer. There is also King Hodr who is a king who doesn’t really enjoy his job and asks his old college buddy Rygart to come fight for his kingdom in his time of need. Hodr isn’t the most inept of kings, but he’s not very good and his wife isn’t much better. Queen Sigyn is a strange woman who wanted to be with Rygart back in the day and got herself locked into a political marriage with Hodr. They sleep in separate rooms and she doesn’t even wear her wedding ring which just shows the sham of this particular marriage. She’s too obsessed with science and books to care particularly about Hodr and is shown to still have obvious feelings for Rygart despite being married off. She’s not a particularly bad character and I can’t blame her since she’s in a lousy situation like Hodr is but she isn’t very good either. Zess is another friend of Rygart and the royal couple. They were also college friends but Zess went back to Athens and now is a soldier for the other side. He fits the rival role pretty well and his actions show that war is a terrible thing that can tear apart friendships. He has to fight against his old friends and lead armies against his friend’s kingdom. There are also more minor characters like Girge who fits the crazy but good pilot role, Narvi who fits the tough girl role, Cleo who fits the “moeblob” role and so on. The characters aren’t particularly outstanding or different but it is enjoyable to watch them interact. The character portion of this show gets a 7/10. As for enjoyment, I’d have to say I enjoyed this series very much. It may have had been filled with clichés and the story might be generic but I really looked forward to each movie. The mobile suit fights were very entertaining and the character interactions were good as well. There was a fair amount of angst and pointless yelling but that’s just another thing that comes with a typical mecha show so it doesn’t really detract from the overall enjoyment of the show. On the other hand, some of the plot devices that built Rygart’s character were somewhat forced. The particular scene with the widow was reused heavily and I got the idea that it was depressing and one of the tragedies of war but it was definitely overdone. Despite that bit of nagging angst and reused plot devices I still say that it was an incredibly enjoyable series. It had many moments that had me on the edge of my seat and some pretty well done drama. For a rating, I say that the enjoyment section of this gets a 9/10. It wasn’t perfect but it was pretty damn good. Overall it is somewhat hard to rate this show. It has many rehashed ideas and clichés but on the other hand it has a great setting with a likeable cast and great music. I would say that overall Break Blade gets an 8.5 but since MAL doesn’t offer half points in their rating system I’ll just bump it up to a 9 due to the fact that it was very entertaining and it was coupled with great visuals and sound. It’s not the most original mecha show out there, but it certainly does a good job at portraying a less flashy and gritty war which is something that is missing from many mecha shows. Break Blade was a treat to watch and I’d suggest anyone who enjoys the mecha genre or anyone who just enjoys watching an interesting story to give it a try for themselves. The dominant thing that makes break blade has such an average score is the subpar premise and story with 90% of the characters pitiful and feels like their more filler talking dolls than anything of significance to the story. 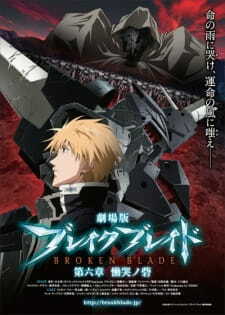 - the premise is pretty bland already, boy with lesser qualities than rest of the people suddenly meet situation where he is now the special chosen one [break blades case: Rygart (main guy) doesn't have ability to do magic unlike the rest of the popolation, but wait suddenly miraculously finds this ancient mecha that is more powerful than the mecha that is in existance (why is some manual relic able to outpower these magic powered mechas I don't get it)]. Yeah I heard this song and dance before it's pretty shounen fair. However that could be overlooked if they can make the story exciting and interesting with compelling characters and their's the war setting so everything should be high stakes and action galor right? The story- Break blade has amazing action I can give it that which is the only thing from the show that I can easily recommend. The more inferior aspects of the movies: I don't like the way break blade handles its war element. Politics are spat out, terror insuses in battle, people die; everything feels dull and inconsequential, even when there's high stakes, after they fought against a kingdom I was not sure what they were suppose to be accomplishing. The friend vs friend thing in the plot was really predictable and was not really settled at all. the running line in this anime is 'omg look at this mecha it's so strong' then they get assaulted. A whole lot of plot holes too (wtf was with that ending). I wasn't invested at all watching this which is a bummer, it looks so cool on picture. Characters- Underdeveloped, forgetable bunch. Eccentric villians, sometimes characters say some amusing things, that's it. Rygart feels a tad hollow but he is the only character I want to see on screen. All characters have one archeatype to associate them with. Sometimes they have sudden "personality switches", they are just really bland. There is good things about this show, it looks GREAT. Production IG with Xebec I don't think I expected anything less. Extremely detailed backgrounds and mechas, animation is great in action scenes. Battles are also well choreographed which pumps the action up considerabaly. Also Death note composer comes and brings a hollywood score for break blade. His music is chaotic and serene that is probably one of the best soundtracks in anime. I listen to it often. most likely a different end...?